There are many reasons to replace several of your favorite tee shirts with the men's Tech Lite Long Sleeve crewe when you pack for an adventure. The first is comfort. 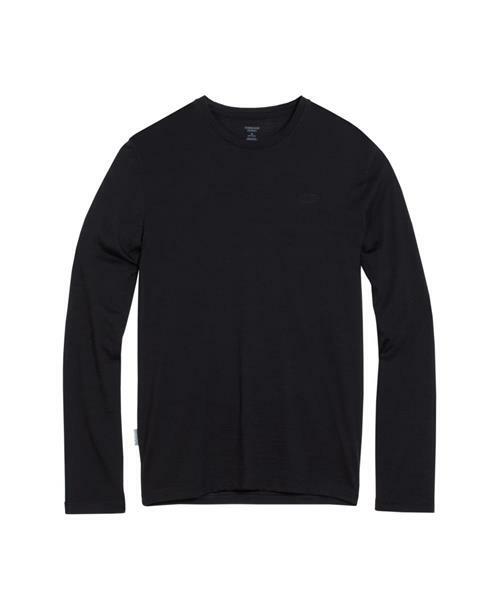 Made from 150gm merino jersey, with a touch of LYCRA®, it feels very soft against your skin, breathes well in warm weather and keeps you warm when it's cool. And because it's merino, you can wear it several times between washings, because the one thing you probably don't want to look for when you're sightseeing is a laundry. Tech Lite LS Crewe - Mens is rated 4.3 out of 5 by 7. Rated 1 out of 5 by Hasweld from Sleeves too short I'm 6'6" and fit in most brands XXL shirts. I fit the XXL short-sleeved t-shirts from icebreaker. For this long sleeved shirt, the sleeves were very short for me. The length and fit in the torso was good. Rated 5 out of 5 by Ryanvandomp from Camping 2017 Purchased this long sleeve shirt after owning the hoody version of it. I've taken it on several camping trips this summer, and it has been good at night when it cools off. It is extremely light and packable, and I intend to take it overseas next year. Rated 5 out of 5 by bbaker45 from Mr B Baker The shirt is very comfortable and looks good with casual as well as more more formal attire. I can wear this in cool weather as well as warm and it is very comfortable. This is an excellent product that will give comfort and look good for a long time. Rated 5 out of 5 by besttshirtever from One more in my collection I love these so much I now have a dozen! They are great value. Comfortable, stylish and great for every day wear. Rated 4 out of 5 by Bpremium from Comfortably warm Feels great and looks great. It's very versatile as a base layer or on its own. Rated 5 out of 5 by PierreM from Good looking Good looking workout shirt. It's loose yet fits snug.